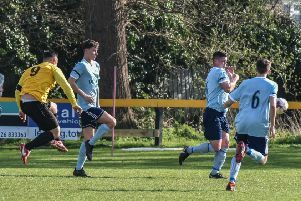 James Keller opened the scoring for Southam at home to Uttoxeter Town. Southam United were unable to hang on for their first win of the season after taking a first-half lead at home to Uttoxeter. Fresh from a 12-0 mauling at the hands of AFC Hinckley, Southam, who started 16-year-old Nathan Robertshaw at right-back, put in a much-improved performnace. And, while disappointed with the final result, manager Ian Ray was in reflective mood after the match. “Once again we have suffered injuries and lost a game which we might easily have got something out of,” said Ray. “We do, though, have to take the positives out of a strong first-half performance and build on these before our next game. The home side took the lead in the tenth minute when James Keller ran on to Suki Nijjar’s fine pass and calmly slotted the ball under visiting keeper Mike Allen. Despite continuing to have the better of the half, Southam were unable to score the elusive second goal despite coming close on several occasions while, in a rare break, keeper Nathan Carro made a fine double save to thwart Uttoxeter. With the returning George Swain in fine form, Southam resumed their control of the game but suffered an injury blow when Dan Brierley rolled his ankle and had to be substituted. On the stroke of half-time, Robertshaw was poleaxed from behind by a late challenge from Martin Gadsby who was duly booked. However, Robertshaw never fully recovered from the challenge and was forced to come off early in the second half. The visitors started the second period in stronger fashion and forced an equaliser in the 53rd minute. Louis Sherwin weaved his way across and into the penalty area and squeezed his shot in off the left-hand post just beyond the reach of Carro who banged a shoulder on a post in his vain attempt to save. This buoyed the visitors and, with Saints dropping deeper, they took command of the game. It was no surprise when they took the lead in the 73rd minute. A long ball caught out the home defence and it was squared to the unmarked Oli Ritchie to tap home. A few minutes later, goalscorer Keller was shown a red card after a dangerous late challenge on half-way. A man down, Saints never looked like forcing an equaliser and it was Uttoxeter who came closest to adding to their tally in the closing stages.